Flattened out by the Nazis in World War II and seeing another 40 years of socialist oppression Poland’s capital city has seen its fair share of history. But what about the Warsaw of today? When in London, be sure not to miss out on Tower Bridge, Picadally Circus and, of course, Buckingham Palace! — the Buckingham Palace? In London? Now that is someextraordinary advice. The question is, however: Who really wants to read that? The answer is hardly anyone does, and if there is one group that will not benefit from this kind of “advice” it is men who enjoy traveling as they will be looking for activies that suit their particular interest. Alas, it would be inacceptable to simply bash what others have to say without putting your money where your mouth is. That is why we are starting the Men’s Edition of the “Top 5 Things To Do” for cities that are interesting to men. Just like the 48 Hour Guides all episodes in the series will come in the same quality you are used to see on Euromentravel.com. And they all will feature the advice from real people who live in the cities and who know them in and out. Manly things at their best – this time from Warsaw, Poland. First up is Poland’s capital, Warsaw. Now, we all know that Poland beats Germany hands down in a comparison of what both countries have to offer to the Single Man. 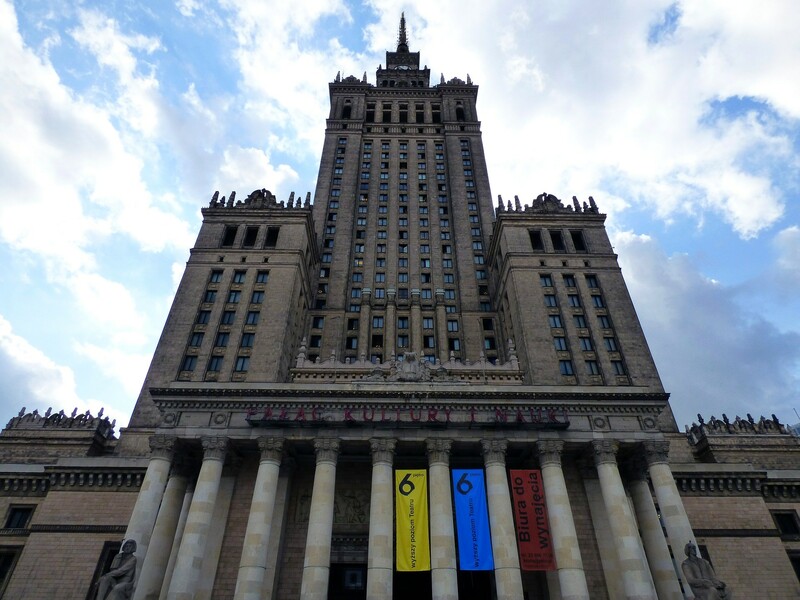 But what do you really know about Warsaw, Poland’s largest city? Even though bigger than Stockholm and Oslo combined the city is still somewhat undiscovered by travelers. Wrongfully so, I say. Let’s have a look the Men’s Edition of the Top 5 things To Do In Warsaw. It’s a little known fact that Warsaw is one of Europe’s city with the highest density of skycrapers. Located on the rooftop of Spektrum Tower in the heart of Warsaw lies The View, one of Warsaw’s hottest nightlife venues. Featuring grade-A DJs like Tom Novy The View plays the finest in House Music and offers a sight over the city that is, well, breathtaking. While a bottle of Dom Perignon is on-par with Western prices there is a mild cover charge of only 4,50 Euro, Bertrand points out. “And with drinks setting you back just 6 Euros on average The View is a high-class venue that is not likely to break the bank”. — the breath-taking view over the city comes free of charge, we’d like to add. Warsaw’s recent history is a unique blend of turbulence and tragedy. Beginning with the Siege of Warsaw by the German army back in 1939 Warsaw has been confronted for more than half a century with either destruction or oppression. The Germans who with the first day of their capturing of the city started to deport Warsaw’s Jewish population into death camps practically flattened the city out by the end of World War II. The reason for the devastating rage of the Germans? The people of Warsaw initiated an uprising against the Nazis who held their city in a deathly grip for almost six years. After the Uprising of the Warsaw Jewish Ghetto in 1943 the The Warsaw Uprising of 1944 is the largest armed uprising to ever take place on German occupied territory during the war. To this day the people of Warsaw remember the heroic fight against the German death machine that lasted for 63 days and ended in surrenderto an enemy that outnumbered them by the thousands. Agnieszka Bedyńska is a local photographer who captures the annual happening that draws in people from all over the country. Dressed in the fashion and uniforms of the 1940s and — together will an abundance of militaria ranging from guns to even tanks — the events from the time of August 1944 to October 1944 are reenacted to reminiscence the spirit of resistance. However, there is a bit of uncertainty about the exact dates of when the event will be held as it is organized on a complete voluntary basis. Agnieszka has the advice to check with the website of the Museum of the Warsaw Uprising where there is a good chance that upcoming reenactments will be announced. In case there are no locals in the know about the reenactments just heading for the Museum of the Warsaw Uprising will be your best option. Not only will there be people who might know, the museum itself is very well worth a visit. Originally a retailer for Scotlad-based Ballantines Whiskey the George Ballantines Shop has Warsaw’s largest assortment of high-quality liquor. Established in 1995 all three hops are direct branches of the Ballantines company and are all located in the absolute heart of the city. Apart from whiskey the Ballantines shop offers a vide variety of almost every kind of liquor under the sun. Go here for a quality bottle of local Vodka as every the shop has no less than 2000 different products on display. In case you were wondering, the answer is yes, they do sell Absinth and have plenty of offers for you to choose from. Banned in most of Western European countries for its insanely high percentage of alcohol Absinth is a unique mix of herbs, spices and, well, high percentage alcohol. 0,5L bottles of Absinth start at 96 Zloty (23 Euro). Prices for a good bottle of local Wódka start from 59 Zloty (Dębowa) and go all the way up to 439 loty (Royal Dragon Imperial). It is no wonder that famous consumer portal yelp.com lists the Ballatines Shop’s price range as “ultra-high-end”. Open every day of the week, watch out for their modest opening hours from 11.00 to 16.00. If you are looking to experience real Polish cuisine that goes beyond Pierogi then having dinner at Folk Gospoda is the way to go. With the reputation of one of the best venues for authentic Polish dishes in the whole city Folk Gospoda offers everything Polish cuisine has to offer. With a country-like touch located right in the city center the restaurant grants forwholesomness as well as healthy portions and is popular with locals and travelers alike. Go here to either try Polish classics such as Pierogi or go for one of their marvellous pork knuckles or beef steaks. Folk Gospoda is a well-frequented and well-renowned venue which leads to stable yet reasonable prices. The pork knuckle comes at 10€ while it is 15€ for a healthy serving of beef steak with sides and a special cognac-pepper or a wild mushroom sauce. Working out while you are traveling is not always an easy thing to do. Even if you are staying at a hotel that features its own gym there is a high chance said gym wil have little to do with an actual gym like you are used to. This is true in particular if you prefer to train with free weights as most hotels have a pro forma gym that will lack heavily in that department. Looking for a gym outside of your hotel can be burdensome, too, as every larger gym will require you to sign up for long-term membership in order to train – an option that is simply out of the equation if you are staying for a limited time only. However, if becoming a regular member was just what you are looking for then there is good news. Monthly rates start from just 14€ – without any obligation to remain a member for the following month, that is. Furthermore, the CityFit Warsaw has been built from scratch only in 2005 so all of the equipment is new. CityFit has to franchises in Warsaw with the bigger of the two located not only right in the city center, but even in the same street as as skyscraper bar The View. At over 3200m² the gym itself is spacious with a well-kept assortment of free weights. Staff is friendly and attentive.